aetiology The cause of a disease. symptoms. A method of treating disease with remedies that produce effects different from those caused by the disease itself. From allos "opposite" and pathos "suffering". Conventional medical practitioners are "allopaths". anatomy The study of normal physical structure. ATP is the main energy source for the majority of cellular functions. This includes the synthesis of macromolecules, including DNA, RNA, and proteins. capsular ligament a ligament surrounding and encapsulating a gliding joint to enable lubricating fluid to be contained within the space created by this capsule. It adds a small amount to joint stability. 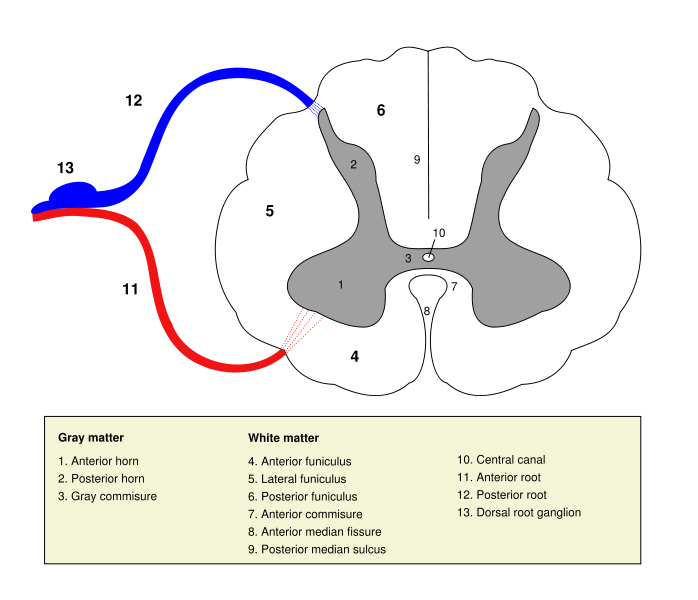 cauda equina syndrome Cauda equina syndrome is a serious condition caused by compression of the nerves in the lower portion of the spinal canal below the spinal cord - L2 or lower. coccyx A group of 4 or 5 spinal bones below the sacral bone, sometimes called the "tail bone". conjecture A statement or idea which is unproven, but is thought to be true; a guess. cartilage; and bone. Blood and lymph may be regarded as connective tissues, the ground substance of which is a liquid. (Latin contra; against): on the opposite from another structure. Thus, the left arm is contralateral to the right arm, or the right leg. next. After puberty discs do not have a blood supply and as such depend on diffusion of nutrients through the bony end plates of the vertebral body. Discs serve as cushions, and are the spine's shock absorbing system. They protect the vertebral bone, the brain, and nerves. The discs also provide a means some vertebral motion: extension flexion and rotation. Individual disc movements are small, but taken as a whole spine, considerable motion is possible. The health of the disc determines the health of the spine. The health of the spine can determine the health of the nervous system. The health of the nervous system determines the health of the person. A state where in the body, in some way, is malfunctioning but has the ability to return to a state of ease, well being or health. empirical Knowledge produced as a result of experimentation or observation. 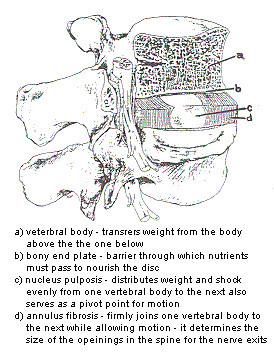 end plate The upper and lower part of the vertebral body to which the spinal discs are attached. brain, and considerably more than the number of neurons in the spinal cord. The enteric nervous system is embedded in the lining of the gastrointestinal system. allow for better appreciation of its nature. fibromyalgia Fibromyalgia (FM) is a chronic condition where people experience varying levels of fatigue, headaches, stiffness and pain in the muscles and joints throughout the body. Fibromyalgia is generally referred to as a syndrome, as it has specific signs and symptoms that occur together. grey matter A collection of nerve cell bodies. Health is a state of complete physical, mental, social and spiritual well-being and not merely the absence of disease or infirmity. of a tissue, structure, or part of an organ through the muscular tissue or the membrane by which it is normally contained. 1. The ability or tendency of an organism or a cell to maintain internal equilibrium by adjusting its physiological processes. hyper excessive (or above) compared to expected or normal. The intelligence we're talking about is the "knowledge" or blue print that every living entity is born with, which allows it to adapt to the environment in order to be well and survive. The inherent complex of attributes that determines a persons moral and ethical actions and reactions. A state of acting from a position of ones convictions. nerves leave the spine and extend to other parts of the body. Also called a neural foramen. determined constant. A theory may contain a set of laws, or a theory may be implied from an empirically determined law. longitudinal ligament Ligaments running down the entire length of the spine. There are two of these ligaments one at the front of the vertebral bodies and one at the back. The 5 spinal bones between the sacral bone and the thoracic vertebrae. There may be 4 to 6 of these bones. luxation A dislocation of a joint. Closely connected with the blood and circulatory system, the lymphatic system is an extensive drainage system that returns water and proteins from various tissues back to the bloodstream. It is comprised of a network of ducts, called lymph vessels or lymphatics, and carries lymph, a clear, watery fluid that resembles the plasma of blood. It is also intimately associated with the immune system and the production of WBC's. An electrical current that measures in the order of millionths of an ampere. This is of the order of magnitude that the human body generates for its proper functioning. A cellular component of the Nervous system which is capable of receiving and giving minute electric signals to other nerves and tissues. These signals are the means of communication within the body and outside the body. nucleus pulposis the inner jelly like substance within the central portion of the vertebral discs. Its job is to distribute loading pressures of the spine and to act as a pivot point for movement. osteophytosis / osteophyte An outgrowth of bone usually indicative of injury or abnormal stresses on the bone where they occur. The intersection of two older, related disciplines: (normal) physiology and pathology. It is the study of physical processes as they deviate from normal physiology. electric potential (charge) in response to an applied mechanical force. The intentionally or habitually assumed body position. A reflex action is involuntary and almost instant response (of some sort) to a stimulus. 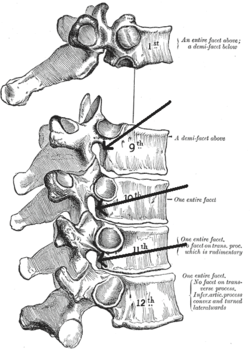 A posterior (backward) movement of one vertebra on the vertebra below. physiology The study of normal function in a body. The portion of the spine below the lumbar spine and above the coccyx lying between the pelvic bones. This bone is made up of 4 to 5 segments which should be fused by the end of puberty. The term is often used as a pejorative to indicate the improper usage of science or scientific claims. sclerosis a hardening and hence greater density of tissue. 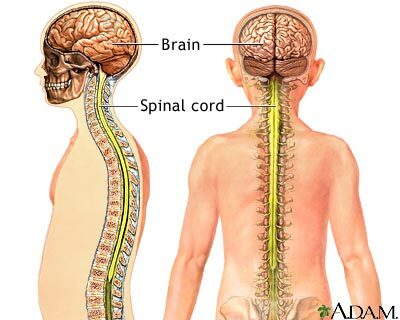 spinal cord That part of the central nervous system that extends from the brain into the spinal canal. Branching from it are sensory and motor nerve roots. spondylolisthesis A forward (anterior) slippage of a vertebral body relative to the vertebra below. 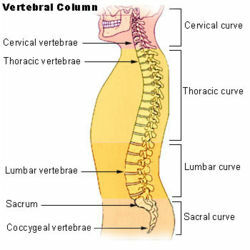 This is usually considered to be accompanied with a fracture through either or both pars of the vertebra. as a result of abnormal strain. 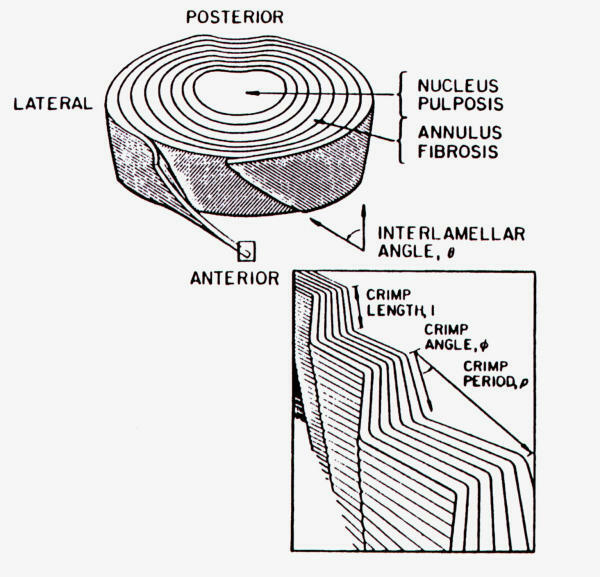 a joint (most important of which are spinal joints) which also alters nerve function. f) Progressive degeneration of the spinal joints. The subluxation is not a thing to be studied; rather, "being subluxated" is an abnormal quality of some physical bodily systems which may lead to loss of health and performance capabilities. ation: a state of being. Hence: A condition where there is less orderly information flow within the body less than is ideal. symptom Any subjective evidence of disease. together and which reflect the presence of a particular disease. available for use in chiropractic practice. The tough connective tissue at the ends of skeletal muscle which attaches the contractile muscle to bone. tensegrity The exhibited strength that results when a push (skeleton) and a pull (muscle) have a balanced relationship with each other. This makes for a strong, light and flexibly manoeuvrable body/structure. cervical vertebrae and the lumbar vertebrae. This portion of the spine has ribs attached to it. There may be 11 to 13 bones with ribs. translation (physics) The position change of an object relative to its previous, usual (normal) position. Usually describes a sliding or gliding position change. vacuum phenomenon Vacuum phenomena are a reliable indicator of disc degeneration. It is a linear dark zone within the disc viewed on lateral x-rays. It indicates a tear of the fibrous portion of the cartilage. vein Blood vessel leading blood towards the heart. vertebra A segment of the spine. In humans there are 24 movable segments (7 in the cervical (neck) region, 12 in the thoracic (mid back)and 5 in the lumbar (low back)regions) as well as 5 segments fused into 1 bone, the sacrum, and 4 to 5 segments that make up the coccyx. There may be variations on the numbers such as 6 lumbar bones with only 4 sacal segments etc. 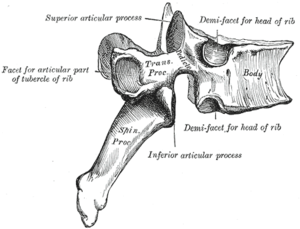 vertebral segment which has the task of transferring weight from one segment to the disc below and hence on down the spine.